A few weeks back, we spotted a freshly-painted Airbus A320 parked on the tarmac at San Francisco International Airport. That wouldn't normally be a big deal, but this particular plane was done up in Virgin America livery, which seemed to suggest that the new discount airline is finally ready to get off the ground. 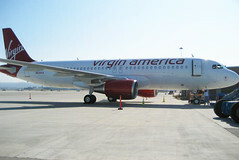 Virgin America isn't flying yet; the airline, which will be affiliated with Richard Branson's Virgin empire, has been mired in regulatory red tape as certain incumbent rivals (*ahem* CONTINENTAL *cough cough*) have tried to delay the entry of new competition into an already crowded marketplace. You can find a lot of new movies, games and music there. Enjoy it! !